Here is the pretty 17th century Church of El Salvador (Iglesia de El Salvador), situated beside the Balcón de Europa in the heart of Nerja. Although a religious site since 1505, the existing structure was not completed until 1697. One of the tallest trees in Nerja, towering high above the church itself, stands outside, casting wonderful shadows on the exterior of the building during the hours of darkness. 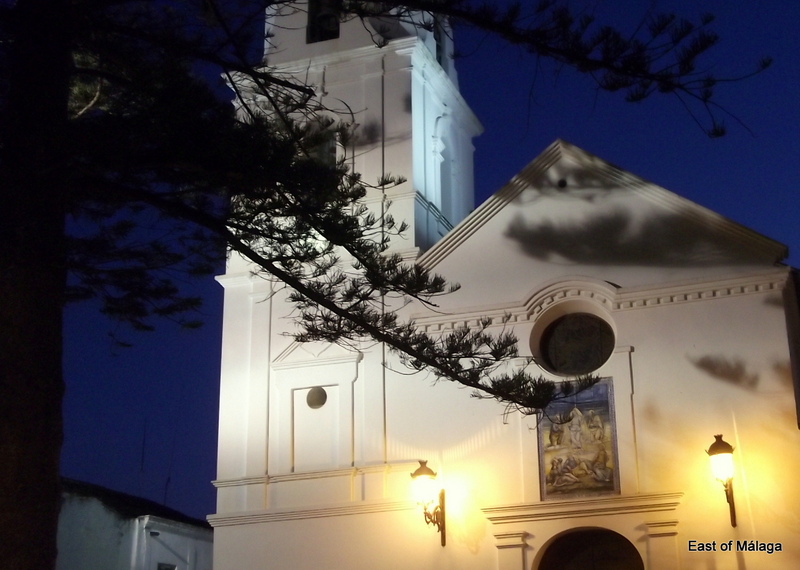 Because of it´s picturesque location, the Church of El Salvador is a very popular venue for weddings. This entry was tagged Andalucía, East of Malaga, Malaga, Nerja, night, photography, Post a week, Spain, travel, Travel theme. Bookmark the permalink. Oh that’s a beauty! Reminds me of one of our Tavira shots, though the belfry’s a completely different shape. What a lovely night scene, Marianne! Great choice for the theme. Thank you so much. I found the night theme quite challenging, but I’m pleased with the result. Really great shot, Marianne, I love the black of the branches against the illuminated church. Yes, I like the way the branches look, too. I have SO much to learn about photography and your weekly Travel Theme is a great way to practice. Thanks for that, Ailsa.